Healthy coral reefs are among the most biologically diverse, culturally significant, and economically valuable ecosystems on Earth. They provide billions of dollars in food, jobs, recreational opportunities, coastal protection, and other important goods and services to people around the world. Coral reefs face an increasing number of threats, including pollution, unsustainable fishing practices, and global climate change. According to the Word Resource Institute, more than 60 percent of the world's reefs are under threat from local stressors, like fishing and land-based pollution. That number jumps to 75 percent when local threats to reefs are combined with the threat of thermal stress from a changing climate. As a result, in the U.S. 22 species of coral are now listed as threatened under the Endangered Species Act. Given their incredible value, it is now more important than ever to address and reverse the threats impacting coral reef ecosystems. The NOAA Coral Reef Conservation Program is leading efforts to study and conserve these precious resources for current and future generations. 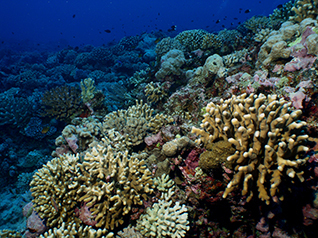 The NOAA Coral Reef Conservation Program brings together expertise from across NOAA for a multidisciplinary approach to studying these complex ecosystems to inform more effective management. We work closely with NOAA scientists in the National Ocean Service, National Marine Fisheries Service, Office of Oceanic and Atmospheric Research, and National Environmental Satellite, Data and Information Service. Collaboration is critical to coral reef conservation. We partner with state and territorial governments, academic institutions, non-governmental organizations, and community groups to take targeted approaches to local issues that impact coral reef ecosystems. The NOAA Coral Reef Conservation Program's mission is to protect, conserve, and restore coral reef resources by maintaining healthy ecosystem function. 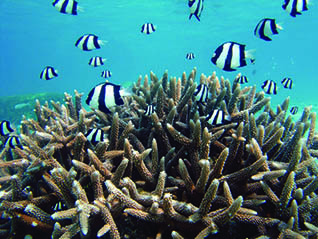 The NOAA Coral Reef Conservation Program was established in 2000 by the Coral Reef Conservation Act. Headquartered in Silver Spring, Maryland, the program is part of NOAA's Office for Coastal Management. The Coral Reef Information System (CoRIS) is the program's information portal that provides access to NOAA coral reef data and products. Thank you for visiting NOAA’s Coral Reef Conservation Program online. Please take our website satisfaction survey. We welcome your ideas, comments, and feedback. Questions? Email coralreef@noaa.gov.